It’s definitely a different feeling being on the other side of things. I remember as a medical student and resident on my surgery and burn rotations after rounding on my floor patients in the morning heading to the pre-op area and making sure everything was in order for the first cases in the morning. I remember gowning and gloving up and assisting with surgeries and I remember throwing masks/caps and booties on in order to go and talk with one of my senior residents who was in the middle of a case in one of the ORs about a patient on the floor or in the ICU. And I remember helping hand pump someone’s heart as we rushed the patient up from the ER into the OR and waiting until someone could take over and then walking back down stairs to my next ER patient. I knew the routine and the dance of the OR and many of times walked with the patient from the OR to recovery and wrote the orders for the floor. 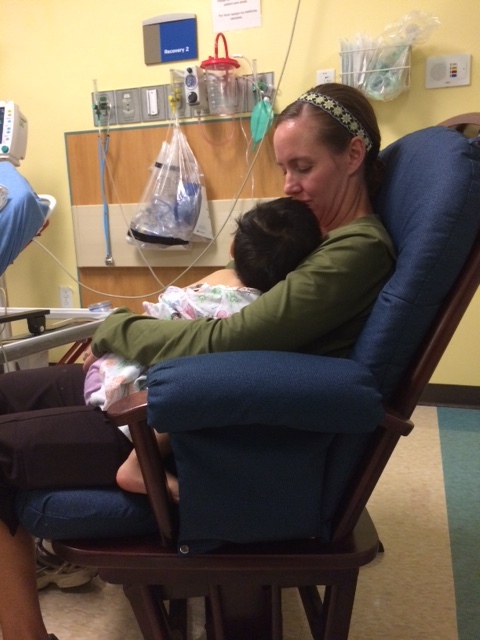 However being a mom of the OR patient is a different story. Checking in at the front desk and waiting in the waiting room and then getting called back to pre-op and waiting in the chairs and not being the one in scrubs and cap is totally different. Carrying my son back to the operating room and lying him on the table and watching him go to sleep and the gently kissing his cheek and walking back out de-gown and wait in the waiting room is a whole different thing. When Leighton was just shy of 3 months old he had to have surgery to repair 3 hernias. 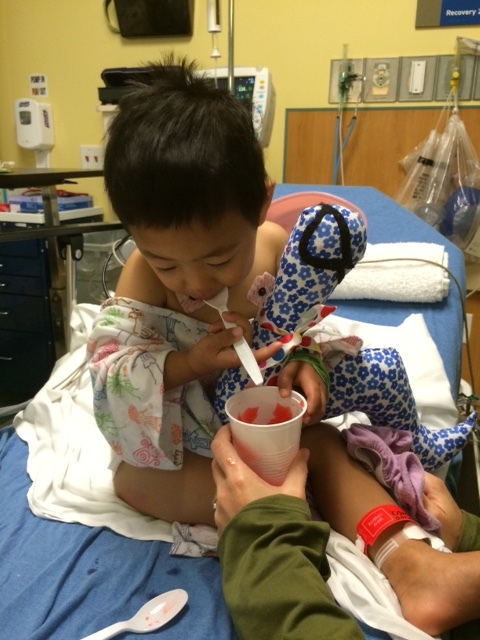 And it was hard to let anesthesia take him away and then sit and wait and wait. He did great, it was far harder on me then it was on him I think. 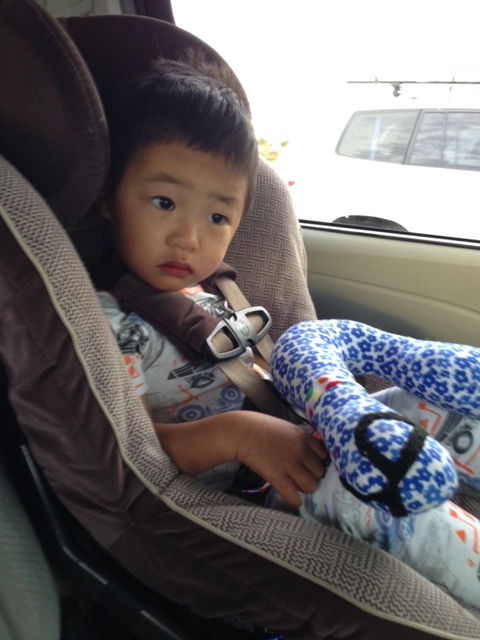 We had been told by our pediatric dentist that it was very likely that Edric would come home with dental issues since he slept with a bottle and there is a different mouth bacteria in many Asian countries that is very tough on teeth. Despite never being told of teeth issues I wasn’t all that surprised to see holes in his teeth the day after custody. We made an appointment for him to see the dentist a few weeks after he came home. And again I wasn’t surprised when she said that he was going to need work and it was going to require the OR. I was a bit surprised when she said she might have to pull his four front teeth depending on the extent of the damage, but I knew we needed to do whatever needed done in order to prevent further damage. Granted our dental insurance was less than helpful and decided that they wouldn’t pay for anything until he had been covered by them for a year. I not so politely asked them if they were wanting to pay for more extensive damage because if we didn’t fix the problems now, the teeth and damage was only going to get worse, especially since his two year molars aren’t yet in and if they came in before we got the damage fixed they too would likely require more work. Needless to say the dental insurance was no more helpful or willing to help or do what we pay them each month to do. I really had no idea how Edric would do with the whole thing or what to expect from him. I was really worried about keeping him NPO (not letting him eat/drink anything) all morning because he loves to eat, but that actually went pretty smoothly. We had the older two eat their breakfasts downstairs while we played with him upstairs so he wouldn’t get upset. We actually got a call that they were running ahead of schedule so we were asked to come in early. The older boys got to spend the day with my parents. After checking in we played in the play room until we were called back to the pre-op. Edric loved the blocks that were there and seemed fairly content. I’m not sure but I think he may not have had a good experience at a doctor’s office at some point in his life because we were called back to pre-op and when the nurse came in to ask questions and take his vital signs he started to go into shut-down mode. It was actually fascinating and so sad to watch his eyes just go blank and then he closed his eyes and fell asleep. He was pretty much just shutting everything out and shutting down. He did the same at custody and the first few days we had him and on the plane. I just held him and snuggled with him and let him know that mommy and daddy were there. It was a really long couple of hours while we waited in that room for the OR to be ready. We saw anesthesia and the OR nurse and Dr McNear (who is amazing by the way and by far our favorite dentist) and just waited and waited. Finally they told me I could put on my OR suit, which I remember calling a bunny suit or blueberry suit depending on what color it was. Its worn over regular clothes for parents or other visitors to the OR that won’t be participating in the case or anything. It’s a one size/fits all and runs VERY BIG. I felt like a blue balloon. 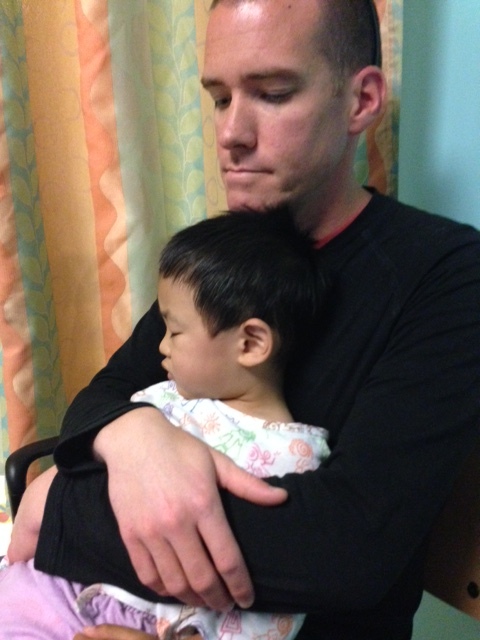 Edric continued to sleep and I carried him back to the OR and laid him down. Everyone was amazed, they said “2 year olds never do this”, and I told them that this was how he dealt with stress. And then it was just a few moments later I was kissing his sweet cheek and walking out to meet up with Clint. We have been lucky, both times our boys have required the OR it has been for relatively minor things. I know that there are families that say goodbye to their little ones (or really any member of their family) not knowing what the outcome will be or what the news will be on the other side. I’m not sure it makes it a lot easier, but I think that it does help some. Clint and I grabbed some chicken tortilla soup from the little bistro stand that was set up and the lady running it is clearly used to nervous parents and talked with us and was upbeat and friendly while she got our order ready. It was really good soup and I think I actually tasted it while I inhaled it trying to hurry to get back to the OR waiting room even though I knew it was going to be just more sitting, praying, and waiting. Finally we were called back to the conference room and Dr McNear joined us and filled us in, she was able to save his front teeth and put caps on them. She also filled and sealed the rest of his teeth that had damage (of the 16 teeth he has, 12 of them had damage). We then had to wait a little longer and then were called to his bedside. 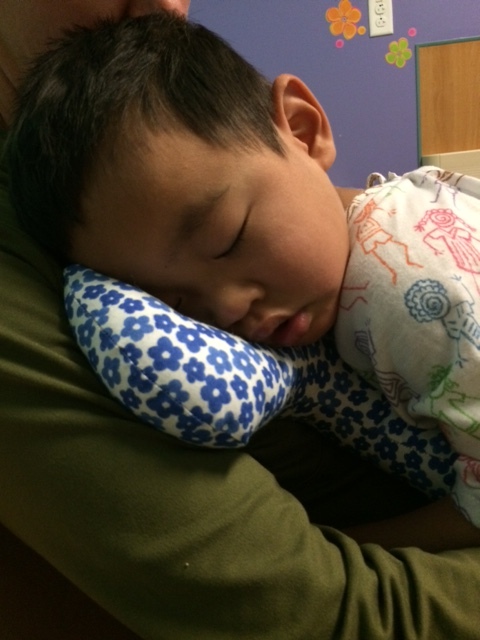 Edric’s eyelids were just fluttering open when I got to his bedside. He kind of woke up enough to drink some apple juice and then fell asleep again in my arms while I rocked. His oxygen was a little low so I held some oxygen up and we just rocked and snuggled while he slept. It took him awhile to wake up fully, at least another hour of rocking. And even then it took some gentle prodding, but a popsicle slushy also helped. And then before long he was packed up and dressed and ready to go. It was a long day, we were all exhausted. Many prayers throughout the day were said and felt. OR days are hard, they were long and hard on the other end as a resident, but I think far more difficult and taxing as a parent and loved one. Hopefully it will be a long time before we have to sit in another waiting room, praying and waiting. Next Post Some Days Are Hard….